After all that time travel to shake her up, you’d think she would be eager to plant her feet firmly in her own time. But, no, she went straight back to the mid 1800s, playing Queen Victoria in Victoria. Writers often find that themselves zipping back and forth through time just to complete one novel. Ghostwriters get even worse jet lag. They often live in multiple time zones, all at once. They might be working simultaneously on a romance novel set in early San Francisco, a drama unfolding in the court of Alexander the Great and a sci fi adventure at some unknown date in a dystopian future. Writers live in multiple time zones! Any writer can travel in time, but to do it well takes effort. Future travel is easy. We all know we’ll wear fish in our ears and scramble our particles in transporter beams. Getting the past right is a little more challenging. Here is a good starter guide to getting the past right. Of course, it’s just a guide. Every book is different. You should have at least two timelines before you even start writing. The first timeline, which is probably most obvious, is the timeline of the story you are writing about. You might create several timelines for this, covering the protagonist, the antagonist and perhaps a few of the other main characters. You might even set out their events on two sides of a single line. The second timeline should be a history line. It should include all major external events that could impact the story. For instance, you might want to include the start and end of World War II, even if the story is not war-related. It should also include all lesser events that are close to the story. Time is a lot like space. You need to know where a story takes place and the major physical or visual aspects of the setting. You need also to know the time aspects of the setting. With the two timelines in hand, you can cross reference the two. Make sure your story fits well into the historical timeline, and make adjustments if it does not. If you plan to outsource your writing, you will save yourself a lot of frustration by getting this done before hiring a ghostwriter. No, they did not have flush toilets in the court of Kublai Khan. How will you deal with that? Technology touches everything. While transportation and communications might be obvious, simple home implements – such as flush toilets – can really color your story. If someone drops by unexpectedly in colonial America, you can’t have the host just put a kettle on. They first have to load the stove up with wood. What would this person be wearing in this era? More specifically, it’s important to figure out what the person would be wearing in various situations, just as we have different outfits for different situations. What about architecture and home décor? How did things look in the garden (were there gardens?) and in the various rooms? Your story might come before plastic was invented or before wall paper was in style, for example. What type of English did the ancient Greeks speak? As soon as you have dialogue, you have language to contend with. How did people speak in those days. If you go far enough back in time, you won’t be able to be totally authentic. After all, what type of English did the ancient Greeks speak? Even if you go back to Shakespeare’s time, the English of the day would make tough reading for us. Much better to use modern English vocabulary with some tweaks that give our modern minds a sense of days gone by. Just as today, there were curses and there was slang in almost every era. Interjecting this more colorful language, where it would have been appropriate, gives your manuscript an air of authenticity. But be careful, because not all slang will be understood and not all curses will seem very sharp to today’s reader. And that’s another thing to get right – social norms. Throughout history, the pendulum has swung between repressive and libertine. Make sure your manuscript reflects where the pendulum was at that time in history. If getting it all right seems like a daunting task, there’s a reason. It is a daunting task. In fact, it might be a writer’s most daunting task. There is a lot of information to seek that we just take for granted in our own time. And the information is not readily available. There are no year-by-year lists one can run to. Perfecting time travel might be a writer’s most daunting task. Museums: There are history museums and there are art museums. Photos and paintings give us some idea of how the upper classes dressed, how they wore their hair, etc. Village museums give a glimpse of how ordinary people lived at a certain time. Books: Many old novels describe the surroundings, and sometimes pictures give an idea of what people and their abodes looked like. Novels from the era can also give you a good idea how to color your dialogue. Documentaries: Whenever a film is available, make a point to watch. It will give you a feel for how things might have been. Keep an open mind, though, because it will be mostly an educated guess. Internet: Of course, the Internet is full of information and images. Academics: If you are lucky enough to find an academic willing to work with you on historical accuracy, you have it made. Academics can provide input in advance, then “proofread” for historical accuracy. Enthusiasts: Less reliable than academics, historical enthusiasts can also be helpful. You’ll find plenty of Civil War enthusiasts, but likely fewer with knowledge of 17th century Finland. Awesome post……. your article is really informative and helpful for me and other bloggers too because writing a quality content is not a cup of tea. Really you have described everything in descriptive, simply yet effective too. You’ve done a great job with this. What a joy to be here again after a long gap. I am here today via your Quora question. 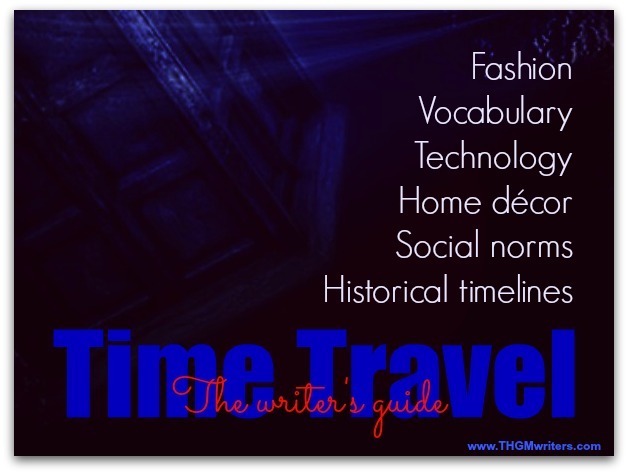 Time Travel Tips for Writers” A lot of tips to pick for writers. Well written post with a lot of practical tips for a genuine writer. “Perfecting time travel might be a writer’s most daunting task. if one can achieve this area, I am sure he will succeed in his task. Thanks Dave for this wonderful and informative shout out especially for a writer like me.